Kurgo is offering International Assistance Dog Week supporters a 30% off coupon code they can use to shop at www.kurgo.com. By using the coupon code, SX4A9ED, you’ll not only get a great discount, you’ll help support IADW. A portion of the proceeds from purchases made with the special IADW coupon code will be donated to International Assistance Dog Week. A company who is committed to providing high-quality dog products, Kurgo also is committed to social responsibility. Over the past few years Kurgo Products has been making donations to nonprofit organizations around the country. These charities are working hard to give humans and pets alike, a positive chance at life. Kurgo’s mission is to help dogs and their owners get out and enjoy an active lifestyle together. This ambition has guided them to develop award-winning products that make this simple joy in life effortlessly fun. Many of the Kurgo products are designed for dogs and humans on the go, and make traveling with you in your car or van safer and more convenient. They also have pet bowls, collars, dog beds and so much more. 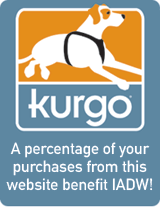 Check out the Kurgo products at www.kurgo.com, use the coupon code and get 30% off your purchase while helping to support IADW. Please share this information with all your friends on your websites and Facebook. Thanks for helping to support IADW!